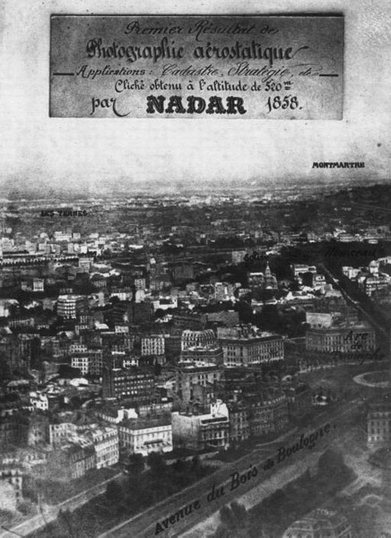 The name of our organization, N.A.D.A.R ., for " Network for Applications and Developments of Aerospatial Remote sensing " is a wink to Felix Tournachon, alias "Nadar" (1820-1910). This French pioneer of the photography is above all an admirable portraitist. He photographed most of his famous contemporaries (Georges Sand, Sarah Bernhard, Jules Verne, Victor Hugo, Charles Baudelaire, etc.). He is the first one to have combined two techniques then recently invented, photography and hot-air ballooning to realise in 1858 the first "aerostatic photography", that is the de-facto birth certificate of air photography.